Home / Blog / Storytelling: How do You Author Your Life? It’s my experience that great storytellers are artful, creative and imaginative. My favorite books are filled with masterful expressions of events and resound a magnetic symphony of words. Stories are an essential way we connect, share history and create possibilities. There are a myriad of ways to tell a story. They can begin at the end, have a moral, build suspense, be shocking, scary and inspiring. Who doesn’t love a good story? And…we all tell stories! We are all creative, imaginative and artful storytellers. 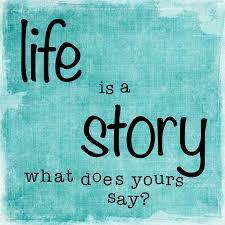 We regularly are telling stories to others and almost constantly are entertaining our own inner stories. Right now, I’m most interested in discovering, What are the stories that I tell myself and others? One story that captures my attention daily is the story I tell myself about my body. Once upon a time, (with less frequent visits) I would tell myself the story from the perspective of what’s going wrong. Viewing myself as needing to be fixed, or that I could be better (if only…). For much of my life, I was committed to seeing myself as a renovation project, needing to undergo constant improvement. Frankly, this feels like a sad, old story. And I’m authoring a new story!! I want to generate stories that feel way better than sad. I want to tell a story that feels really good in my body. Science and life repeatedly and reliably demonstrate that “what we focus on grows”. How full is your cup? Half full? Half empty? Everyday we are experiencing the results of our storytelling and our focus. I believe that I am currently resonating with the results of my focus and the momentum of my repetitive story telling. In other words, the stories I tell repeatedly have a direct impact on what’s happening in my world. Creating a new experience could be as simple as telling a new story. Telling conscious stories of what we love, appreciate and want are powerful steps to becoming the author of our own lives. Now when I see myself in the mirror, I shift my focus from what’s wrong to what do I like, appreciate and even love about being in my body. Whenever I remember, I tell myself the new story of what I want, with an added infusion of appreciation. As often as I can remember~ I am the creative, imaginative, artful author of my life. Are you ready to be the author of your own life? What stories do you tell about your body? What body stories keep repeating that you want more or less of? And are you willing to introduce a new story into your experience? What is your new body story? Sending love and appreciation to all who dare to become the genius creator that you truly are!! I truly love how you two continuously find ways to reinvent yourself and SHARE with others what has worked for you. Love having you in my life, if only through your posts, blogs, invitations. Yum! I receive your appreciation and I feel loved. Thank You. I so needed to be reminded how we tell ourselves stories. Im not having the best day today and i am dwelling on that. Im struggling with some life changes and trying to be gentle with myself but letting negativity take over today. After reading your post, im gonna try to turn that around, starting now, as i still have 1/2 day! Thank you! I appreciate your reply and your optimism. The story I am entertaining today is that everything I feel is true for me and I am willing to feel them all without judging myself to be wrong or right. Thank You Christine.